62 Charing Cross Road, on the edge of Chinatown. There is usually with a low paid (illegal ?) immigrant holding a sign advertising the Internet access on the pavement outside. Inside there are about a hundred internet PCs, for which they charge£1 per hour. The usual warnings apply, - hold on tight to your bags and mobile phones etc. as these are targets of opportunistic sneak thieves, who are not deterred by the CCTV surveillance cameras. Although there is anti-virus software etc. installed, unlike EasyInternetCafes, the software is not rebuilt after each customer session, so the risk of password sniffers etc. is greater. Here is our PGP public encryption key or download it via a PGP Keyserver. Please take the appropriate precautions if you are planning to blow the whistle on shadowy and powerful people in Government or commerce, and their dubious policies. The mainstream media and bloggers also need to take simple precautions to help preserve the anonymity of their sources e.g. Digital Security and Privacy for Human Rights Defenders manual by Front Line. - documenting and analysing William Gibson's current novel in progress, with some London / UK locations already. This documents and analyses William Gibson's novel Spook Country which has some London locations, and from which this London CyberPunk Tourist Guide was spawned. Google UK offices via Google Street View etc. Cambridge Circus - John le Carré's "the Circus"
Centre Point / Tottenham Court Road Station re-development demolitions - Astoria Theatre, Internet Lounge etc. 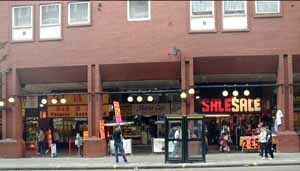 Croydon: Cyberzone Internet Cafe - now defunct ? Croydon: Black Sheep Bar - fingerprint scanning private members alternative music venue - avoid ! Polonium-210 - Hey Jo "Gentleman's Club"